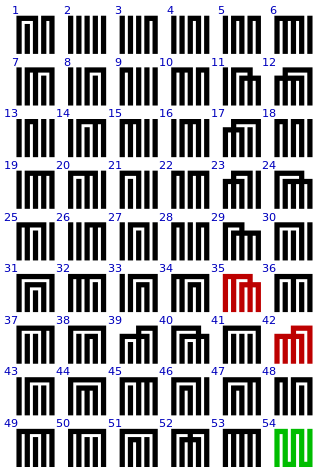 This picture by Tilman Piesk shows the 15 partitions of a 4-element set, ordered by refinement. Coarser partitions are connected to finer ones by lines going down. In the ‘coarsest’ partition, on top, all 4 elements are in the same subset. In the ‘finest’ one, on bottom, each of the 4 elements is in its own subset. 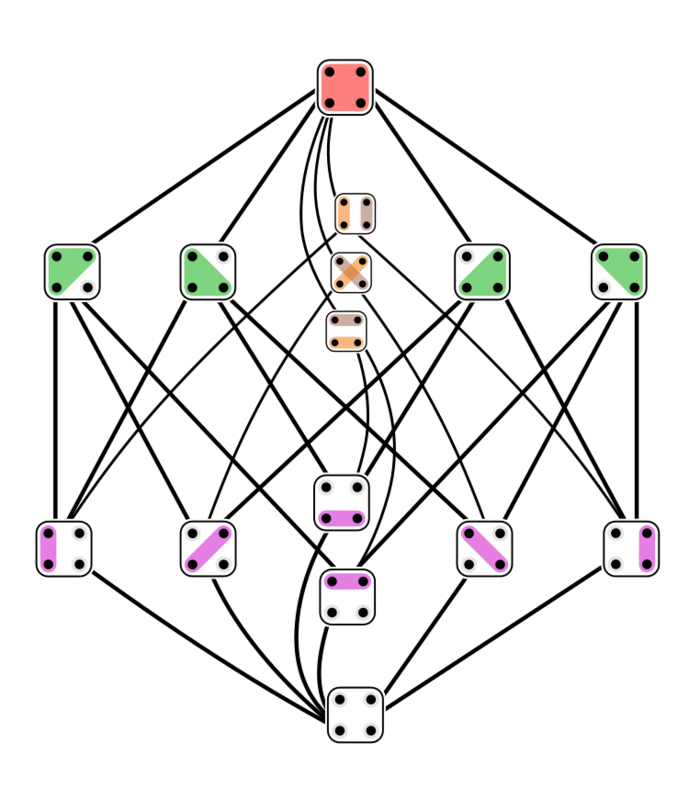 A partition of a set $S$ is a way of writing it as a disjoint union of nonempty subsets called blocks. There is a natural 1-1 correspondence between partitions $S$ and equivalence relations on $S$, so the two concepts are just different ways of thinking about the same thing. In this situation we also say that $\sim’$ is coarser than $\sim$. We also use these words for the partitions corresponding to these equivalence relations. A partition $\pi$ is finer than a partition $\pi’$ iff every block of $\pi$ is contained in a block of $\pi’$. This puts a partial ordering on the set $\Pi(S)$ of all partitions of $S$: we say $\pi \le \pi’$ if $\pi$ is finer than $\pi’$. In fact this makes $\Pi(S)$ into a complete lattice. This lattice is much subtler than the lattice of subsets of $S$: for example, it typically fails to be distributive. • E. Rodney Canfield, On a problem of Rota, Adv. Math. 29 (1978), 1–10. • Ronald Graham, Maximum antichains in the partition lattice, The Mathematical Intelligencer 2 (1978), 84–86. • E. Rodney Canfield and Larry H. Harper, A simplified guide to large antichains in the partition lattice, December 13, 1999. The Tale of Genji is a wonderful early Japanese novel written by the noblewoman Murasaki Shikibu sometime between 1008 and 1021 AD. It has 54 chapters. Above you see the 54 Genji-mon: the traditional symbols for these chapters. Most of them follow a systematic mathematical pattern, but the ones in color break this pattern. Puzzle 2: How is the green Genji-mon different from all the rest? Puzzle 3: How are the red Genji-mon similar to each other? Puzzle 4: How are the red Genji-mon different from all the rest? Puzzle 5: If The Tale of Genji had just 52 chapters, the Genji-mon could be perfectly systematic, without the strange features exhibited by those shown in color. What would the pattern be then? The lattice of partitions was drawn by Tilman Piesk and placed on Wikicommons under a Creative Commons Attribution 3.0 Unported license. The chart of Genji-mon was created by ‘AnonMoos’ and put into the public domain on Wikicommons. 15 June, 2015 in Combinatorics, Images Library. The explanations of ‘coarsest’ and ‘finest’ are inverted! Whoops! This mistake was created in the process of fixing another accidental reversal: I originally said the finest partition was on top. Thanks, I’ve fixed this mistake. But you still say that finer partitions are connected to coarser partitions by lines going down. Isn’t it by lines going up? Yes, I’ll fix that too. I have a combinatorial question: is it known how do the number of different paths joining the finer and the coarser partition grows with n? Each path correspond to a different sequence of “splittings” of the whole…. I don’t know the answer to this, offhand. But almost every counting problem involving partitions has been studied by someone!